This past week, a crew from the Department of Chemistry and Biochemistry traveled to Denver, Colorado to attend the 249th Annual Meeting of the ACS. There were four students (myself included) and three professors who attended the meeting. It presented the unique opportunity to not only hear about the many different projects being carried out in the multifaceted world of chemistry, but also gave us the change share our own research to peers and graduate level chemists. There were research presentations going on during the day focusing on different research projects. It was interesting to see how many different kinds of research projects there were and how broad a field chemistry really is. Since I hope to one day obtain my PhD, it was motivating to hear about all the different areas of chemistry, and will help me make an informed decision on which field I want to enter. The presentations covered such topics as renewable agricultural and food chemistry, analytical chemistry, biochemical technology, catalysis science and technology, chemistry and law, and environmental and geochemistry. In the evenings, there were poster presentations by graduate level chemists. These presentations gave us new ideas and insights into our own projects on campus that will, no doubt, prove useful in our future endeavors. We also had the opportunity to present our current research at the Undergraduate Research Poster Presentation. 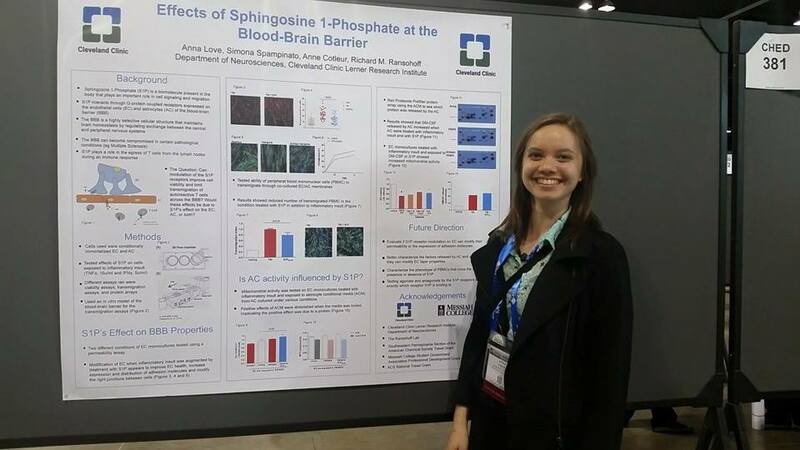 I presented the research I conducted at the Cleveland Clinic over this past summer, and it was really interesting to see all the different posters and talk to the other students about their research. It was also good experience for my future in scientific research to present my poster to others. I also had the chance to share with some professors and graduate level chemists, which provided networking opportunities for the future.